The TGH™ system provides the client with the highest level of safety, reliability, and user friendly options that is available for aircraft ditching training today. The monitoring and expandable control functions offer the client accurate, and repeatable training routines. Options for the system includes documentable training routines, as well as the ability to control and sequence other training devices such as wind, waves, rescue hoist systems, and other environmental variables for a complete and state-of-the-art training system. The METS® Model 9000 TGH™ is mounted above the pool and features dual lifting mechanisms, integrated METS® remote air brake system, user settable variable ditching speeds, as well as a pneumatically operated redundant retraction system (RRS) to address the risk of power failure during critical (submerged) periods of the helicopter underwater escape training (HUET) training cycle. The system is a cost effective, very low headroom, retrofit design for replacing aging hoist systems, is very easy to use, and can be installed indoors, outdoors, in pre-existing, or in new facilities as required. 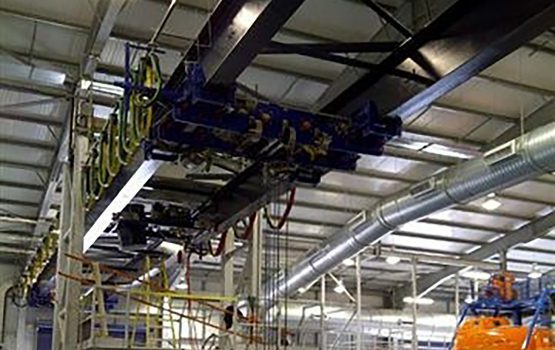 Twin Gantry Hoist (TGH™) can be customized to suit your needs. Please see the options below. If you have any questions, please contact us. The TGH™ is fully compliant with all industry personnel lift guidelines and standards for installed personnel hoisting capacities up to 5,000 Kg (10,000 Kg material capacity), including CE machinery directives, EN cranes and hoists standards, ASME, US Navy, FEM 1.001.3-1998 and DNV-05-0101 Rules for Certification of Lifting Appliances. The Model 9000 TGH™ is a 10,000 Kg capable static lift system de-rated by 50% to a nominal 5,000 Kg personnel working load at FEM 2m duty classification. Complete duality in variable frequency drive lifting mechanisms, VFDs (2), motors (2), gear boxes (2), drums (2), and cables (4). Each system is capable of independently holding and handling the load through the TGH™ leveling block system. Additional Safety Features include: Independent motor brakes (2) – Pneumatically Operated Redundant Retract System (1) – Integrated Electrical Ground Fault Personnel Protection (1) – Radio Remotes (2) Pendant Crane Control (1) – User Friendly Operator Interface and On-Screen Guide (1) – Operator Training – Installed at Customer’s Site.